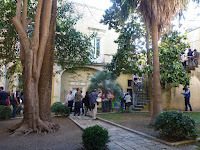 The Lecce Italian Language Experience: September ex-Australia special. From $AUD5530*. September ex-Australia special. From $AUD5530*. There are still some places available on the September 2016 Lecce Italian Language Experience. From only $AUD5530 twin share* ex-Australia including airfares. Over four fabulous weeks you will be immersed in the Italian language surrounded by the culture, history and culinary delights of Lecce and the Salento. There are limited seats at this price and the offer ends soon. Call Max Najar now at Axis Travel on 08 84331133 or email max@axistravel.com.au to book and reserve your place.